Provide comfort for the family of Geraldine Blake with a meaningful gesture of sympathy. Geraldine Blake, 91, passed away peacefully on Saturday, January 26, 2019 at St. Andrews Village, Boothbay Harbor, Maine. She was born to Gerald Pinkham and Hazel (Clifford), the second oldest of fifteen children and named after her father, and nicknamed “Deanie”. One day in her teens, she was down on the wharf and a boy poked her heel with a knife, she chased after him and in the process, bumped into a young, handsome, good natured man, Harvey. It was love at first sight. They were married on March 25, 1944 and spent 65 wonderful years until his passing. Together they raised three amazing daughters: Carol, Cathy and Barbara. Geraldine worked as a housekeeper in several of the local motels. Her life story is best summarized by one word: Family. She loved them all, and enjoyed every minute she spent with them. She enjoyed Sunday rides, picnics and attending family reunions. She and Harvey loved to dance, and would attend dances wherever they could find one. 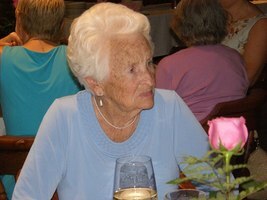 She played card games, listened to music, especially upbeat 1950’s style. She was very active in the Boothbay Harbor Methodist Church and was a part of the Susannah’s, the cooking group of church women. She and Harvey would argue over who was the best cook, him or her. A special memory includes a trip to Disney World she and Harvey took, where she visited the Haunted Mansion she had always wanted to do. She always had a smile to share and was always grateful for her caring and generous family. She was predeceased by her husband Harvey, daughter: Carol Blake Orne, Grandson: Michael Orne, and Son-in-law: Russell Colby. Geraldine is survived by Daughters: Cathy (Gary) Blake of Boothbay, Barbara Colby of Boothbay Harbor, Grandchildren: Lisa (Richard) Hallinan, Teresa Bryer, Tyler (Lynn) Blake, Amy (Dusty) Goodwin. Many great grandchildren, and great-great grandchildren. Sisters: Sandra Barter, Dilys Washburn, and Roberta Chubbuck. Brothers: Larry Pinkham, Darryl Pinkham and Gary Pinkham. And last by not least, her beloved cat, Tabby. In lieu of flowers, donations may be made in Deanie’s memory to Midcoast Humane Society, 190 Pleasant St. Brunswick, ME. 04011 or Boothbay Harbor United Methodist Church, 81 Townsend Ave. Boothbay Harbor, Maine. Provide comfort for the family of Geraldine "Deanie" Blake by sending flowers. Such a beautiful and gracious lady that I was so fortunate to get to know during her stay at St.Andrews. I shall miss her charm and her humor, as well as her loving family. My heart goes out to all of you at this time because I know she has left a huge hole in your family tapestry... but what a wonderful legacy she has left behind. Bless you all!